Fresh, sun-ripened, first-of-the-season strawberries. There is nothing like it. Luckily, they appear at the market just at the time of the year when I start to swear I may never again be able to recall what a real strawberry tastes like. A bit dramatic? Perhaps, but greenhouse strawberries in the middle of winter, imported from who knows where are not for me. I always hold out for them to be in season, because it’s worth the wait. This recipe aims to keep things fairly basic. Sliced strawberries with cream and brown sugar – the way my mom used to do it when we were kids – is pure taste bud joy for me, so I didn’t want to lose that with this dish. 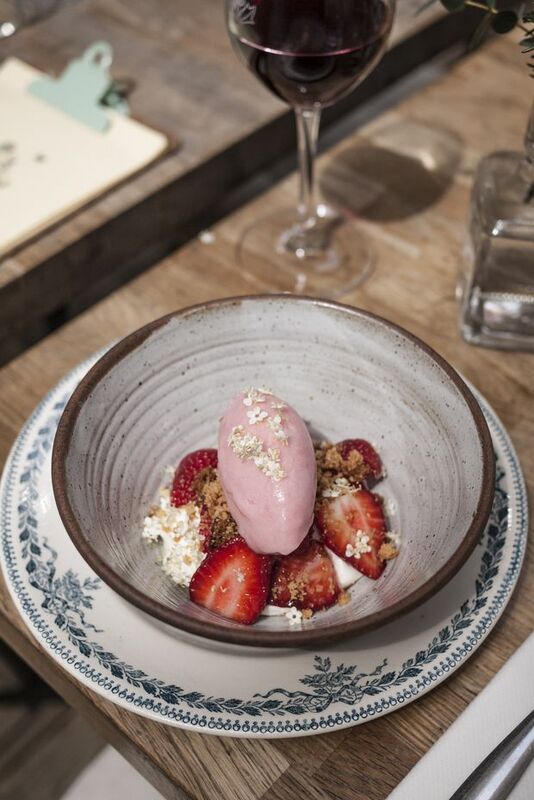 However, I still felt the need to jazz things up a bit at the restaurant by adding a little gluten-free coconut cookie crumble for texture and an easy rhubarb sorbet for a necessary injection of punchy tartness. Try to find the thickest crème fraîche with the highest fat content possible (40 per cent is preferable). It whips up like a dream and has a rich yet mellow tangy flavour that lends itself well to the dish. You can substitute whipping cream if necessary, but know that the resulting whipped texture will be a lot lighter and less creamy than the whipped crème fraîche. For the rhubarb sorbet, if you don’t have an ice cream machine, don’t fret. Simply skip the puréeing of the sorbet base and spoon the rhubarb directly over the berries. The effect, in terms of flavour pairing anyway, will still be relatively the same. If elderflowers are in season in your area, garnish each bowl with a few of these fragrant blossoms for a floral touch that, as with strawberries and rhubarb, can really only be enjoyed together in the spring. Pick them fresh from the bush and store in an airtight container in the fridge before using. Bonus tip: A loosely rolled piece of dampened paper towel in the bottom of the container will help keep these flowers fresh for up to two days. Cream the butter and sugar together until light and fluffy. Add the almond flour and shredded coconut to the butter and sugar mixture and fold together until combined. Roll flat between two sheets of parchment and bake uncovered in 3-minute intervals. Fluff and mix the cookie with a fork between each interval in order to break it up into a crumbly texture. Bake until lightly golden brown. Approximately 12-15 minutes. Mix the sliced rhubarb, sugar and one of the freshly squeezed limes together in a medium-sized pot and allow to sit and macerate at room temperature for 1-2 hours. Bring to a boil over medium-high heat and cover with a lid. Boil for 5 minutes. The rhubarb should be just cooked. Immediately remove from the heat and adjust the seasoning with more lime juice or sugar as necessary. The resulting cooked compote should be tart and punchy with a touch of sweetness to cut through and soften the natural acidity of the rhubarb. Cool completely in the fridge before mixing into a uniform purée using a hand blender. Process in an ice cream machine for around 20-30 minutes or until a smooth and set sorbet texture is achieved. Store immediately in a plastic container in the freezer for minimum 1 hour to allow the sorbet to continue to firm up. If too hard and difficult to scoop, allow to temper at room temperature for 5-10 minutes before scooping. Whip the crème fraîche using a mixer until light and fluffy. Rinse, core and slice the strawberries. Divide the whipped crème fraîche, followed by the strawberries evenly between 6 bowls. Sprinkle with brown sugar and the gluten-free coconut cookie crumble. Garnish with a scoop of rhubarb sorbet and fresh elderflowers. Serve immediately.